Caravan Health is a mission-driven company bringing population health to life. We build Accountable Care Organizations - ACOs - which means we support physicians and community health systems in their goals of improving patient care, clinician satisfaction, and financial performance, while allowing each organization to maintain their independence and autonomy. We work together to help our ACO partners create, operate, and manage successful population health programs to achieve sustainable success. 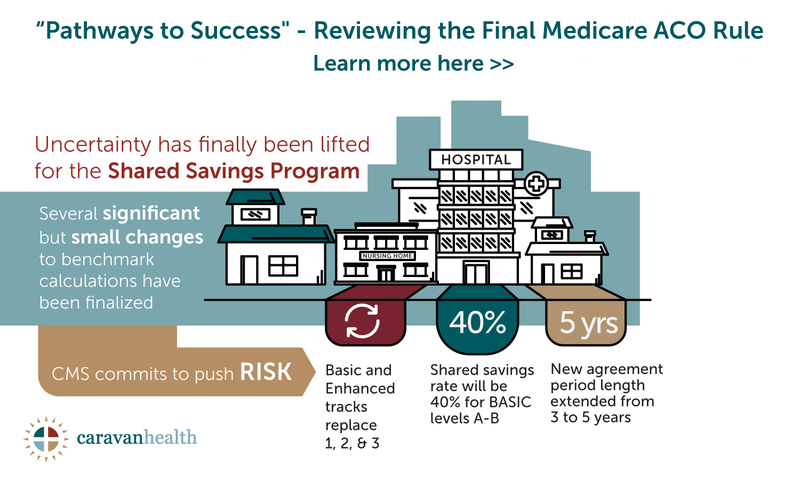 The majority of ACOs struggle to drive savings. Our proven ACO model vastly outperforms national averages and continues to help our partner ACOs improve over time. Caravan Health ACOs have made impressive gains on clinical quality measures for 2017. Out of 22 Caravan ACOs, 15 earned over 90 percent overall MIPS score – several with perfect or near-perfect total scores. We can help you improve the overall performance of your ACO. We can help you understand the process, risks, and benefits of joining an ACO. We dispel common myths about hospitals and ACOs so you can make an informed decision. Variable financial results in an ACO is usually due to having too few patient lives. We can help you overcome this issue.